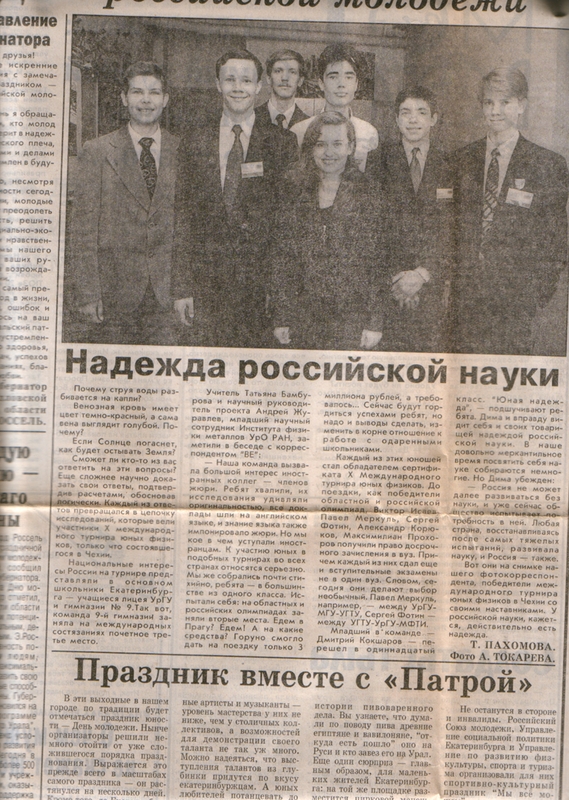 A collection of documents, diplomas, manuscripts, and newspaper cuttings related to the 10th IYPT (1997) has been preserved by Victor Isaev, Russian team member in 1997. In an interview with Nikita Shanin, he comments on the experiences at the IYPT 1997 and shares the archived materials. Victor Isaev was born in 1980 and now resides in Alabama. “Little had such a strong impact on my life as had the participation at the Young Physicists’ Tournament in 1997″, he concluded in a LJ entry dated Dec. 3, 2011. V. I.: Participation in the 10th IYPT was a really fantastic experience for me. I suppose the event had a strongest influence on my further life. Actually, physics is not my chief occupation now, but I am sure something has been changed after that trip. My memories about the tournament are full of warmth. N. S.: May I ask you about some details of your participation in the IYPT that could be interesting for participants of the future tournaments. V. I.: Yes, for sure. N. S.: Were the rules strict for choosing the language for your report? Did jury assist in translating Russian into English? Do you remember reports or discussions in Russian? V. I.: According to the rules you might make a report in Russian if all participants in the room were Russian speakers. In this case a Russian-speaking juror would translate for other jurors who did not speak Russian. Once I had such a situation. However, as I have had prepared my report in English, I preferred not to alter the language for my speech. N. S.: For how long have you prepared to the tournament? Where the national YPT was held? V. I.: We began to prepare in 3 months before the national tournament, during the winter. Besides that we had an extra month for the preparation to the international one. N. S.: As far as I know you participated in the national YPT. Could you remember any different problems in the tournament that you did not face in the IYPT? V. I.: Certainly not. The problems were absolutely similar. As far as I remember there were only 10 problems in the regional tournament due to lack of time for preparation but they were identical to the respective IYPT problems. N. S.: Were you preparing any visual aids for your reports, like paper posters or transparencies? V. I.: Sure, for each of my reports I’ve had lots of transparencies prepared with all necessary formulas and graphs. Truth to be told, there was a lot of complicated mathematics in my reports (specifically – for the “Water jet” and “Roget’s Spiral” problems), so there was no other way to properly present these solution but to provide lots of visual materials. N. S.: According to your impressions, most reports at the national YPT were theoretical or there were many teams performing good experiments? V. I.: It’s hard to talk in terms of “most reports”, but, definitely, most of really interesting reports were based on good experiments. We’ve been trying to provide good experimental base for all our problems. N. S.: Could you recall the problems reported by finalists (Hungary, Czech Republic and the Republic of Belarus)? V. I.: I am sorry, but I don’t remember. N. S.: Could you clarify the name of your team leaders? N. S.: Did you preserve some interesting materials connected with the 10th IYPT that you could consign to the archive? V. I.: I am sure I have something interesting for you. Definitely I have an item about team and certificates for our participation. Perhaps I preserved my solution of the problem “Roget’s Spiral”. N. S.: Thank you for your effort. I hope materials you have consigned will be interesting for guests of the archive. V. I.: Nice to hear that it could be useful to you. Thank you for your interest. The interview was primarily taken in August and September 2011 with extra archived material collected in March 2012.